It might sound far-fetched, but this Instant Pot Vegan Mac n’ Cheese is inspired by Ina Garten’s recipe that I make every year at Thanksgiving. Her recipe is incredibly rich and decadent– hence why we only make it once a year– and it’s also exhausting to prepare because you have to shred over a pound of cheese. What makes her recipe special is her use of gruyere cheese and nutmeg, which provides a subtle nutty flavor that pairs perfectly with the salty aged cheese. While my recipe doesn’t actually contain any cheese, adding nutmeg to my cashew-based cream sauce makes reminds me of Ina Garten’s original recipe. My dad tasted it recently and told me it’s my best Mac n’ Cheese yet! (Which is saying something if you’ve already tried my best Vegan Mac n’ Cheese recipe.) Perhaps we’ll be serving this one at Thanksgiving this year, since it would save us a LOT of time and effort. 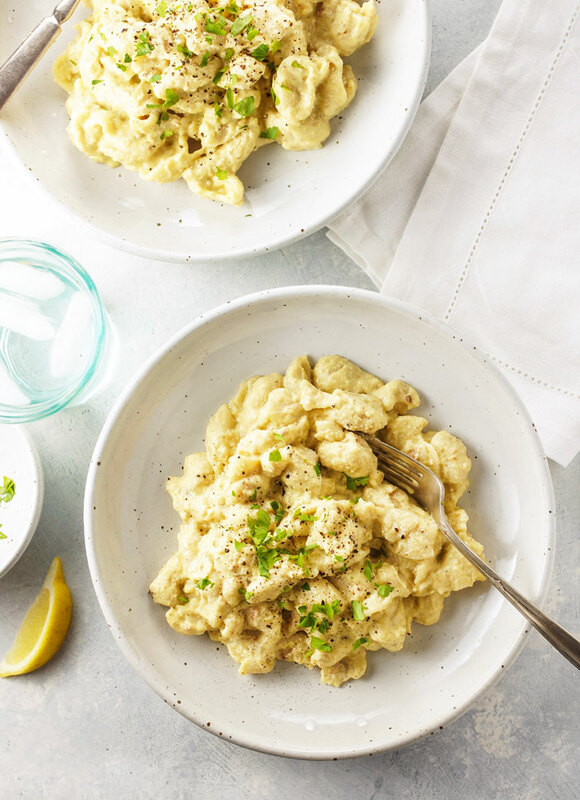 This Vegan Mac n’ Cheese requires just 3 simple steps: Blend, Dump, and Stir. This is my first time developing a recipe where the pasta cooks in the sauce all at the same time, and I love the results. The starchiness of the pasta thickens the sauce, leaving you with a creamier result than if you were to prepare the pasta separately. The only downside to cooking pasta in the pressure cooker is that you can’t stop and stir the pot they way you could if you were cooking it on the stove. As a result, some of the pasta does stick to the bottom of the pan. I found that this issue is easily resolved by stirring a bit more water in at the end of the cooking cycle, which helps un-stick any pasta and also helps to thin out the sauce, making it creamier. Something else to note while making this recipe is the size of your pasta package. This was a total “duh” moment for me, but while I was working on this recipe (making it over 10 times!) I found that I had accidentally bought two different sized bags of gluten-free pasta. So, when I thought I was consistently using a one-pound bag for testing, I was actually using a 12-ounce bag sometimes. No wonder it took me so long to figure this one out! My favorite pasta that I tried while testing this recipe was DeLallo’s gluten-free shells (made from 100% brown rice flour), so I highly recommend you seek out a similar pasta for best results. Enjoy! A fast and creamy dairy-free and gluten-free mac n' cheese made in the Instant Pot! Made with cashews, lemon juice, and nutritional yeast, this sauce is thickened when it cooks directly in the same pot as the pasta. Drain the cashews and discard the soaking water. In a high-speed blender combine the cashews, 2 cups of water, nutritional yeast, salt, lemon juice, vinegar, and nutmeg. Blend until smooth. Add the pasta to the bowl of your Instant Pot, and pour the sauce over the top. Stir well. Use 2 more cups of water to "rinse out" your blender, swishing the water in the empty blender container to help pick up any of the seasoning that may have been left behind. Pour the water from the blender container into the Instant Pot, then seal the lid and make sure the knob at the top is turned to the "sealing" position. Cook on high pressure for 0 minutes (yes, zero minutes), then let the steam pressure naturally release for 8 minutes. When the screen reads LO:08, carefully release the steam in the pot by moving the steam release vent to "venting," then remove the lid. Pour the remaining 1/2 cup of water into the pot and use a wooden spoon to stir well, making sure to remove any pasta that has stuck to the bottom of the pot. Adjust any seasoning to taste, and serve warm. Feel free to make this more of an "adult" Mac n' Cheese by adding your favorite vegetables before serving. I love to stir-in roasted broccoli, sautéed mushrooms, or simply fold in fresh baby spinach so that it wilts before serving. *Note: If you make this in the 8-quart Instant Pot, you may get a "burn" error as it comes to pressure. (This typically doesn't happen with the 6-quart pot.) If you DO get the burn error-- don't panic. In fact, I recommend that you simply wait (LEAVING THE LID SEALED) for 10-15 minutes, so that the pasta and liquid are locked in the heat. This will finish cooking your gluten-free pasta and your meal will still turn out well! When you remove the lid, use a wooden spoon to stir the pasta, scraping anything that might have gotten stuck on the bottom, then adjust the seasoning to taste and serve. To avoid the burn error, you can arrange a vegetable on the bottom of the pot, like chopped cauliflower or butternut squash, to prevent the pasta from touching the bottom. The veggies will become very tender from the cooking and will blend right in when you stir the cooked pasta later! 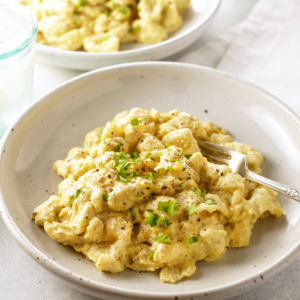 I have a feeling this method would work well for my nut-free Mac n’ Cheese recipes, like my Sweet Potato Mac n’ Cheese or the Butternut Mac n’ Cheese found in my cookbook, No Excuses Detox. I plan on trying those in the future (when I’m not burnt-out on eating Mac n’ Cheese), but if you want to experiment, I’d use the same 4-ish cups of water to 12 ounces of pasta ratio. Stove Top Directions: If you don’t have an Instant Pot, but want to make it on the stove, I would use the same method as described above. Instead of pressing a button on the Instant Pot, simply bring the mixture to a boil, then cover and steam for 10 minutes. Then let it sit for another 10 minutes with the heat off. Feel free to stir occasionally, to help prevent the pasta from sticking to the bottom of the pan. Add extra water at the end if you feel that it is needed for texture, and adjust seasonings to taste. Slow Cooker: I haven’t tested this recipe in a slow cooker yet, but most vegetarian recipes I’ve tried cook well on low for 6 hours, or high for 3 hours. If you try it this way, please leave a comment below letting us know how it worked for you! Variation: If you have leftovers of this Mac n’ Cheese, I like to pour my favorite marinara sauce over the top for a “creamy tomato sauce.” It’s so good, you won’t miss a sprinkling of cheese on your pasta! Food Combining: This nut-based sauce is not properly combined over grain-based pasta, but you can reduce the water for the sauce to one cup and serve it over steamed veggies, cooked spaghetti squash, or spiralized zucchini noodles for a properly combined dish. Reader Feedback: Have you ever made a one-pot pasta before? Let me know if you have another favorite I should try! I added sautéed mushrooms, onions and a bunch of spinach. So I’m making this recipe, I had printed it out and was following along when I got to where it says 0 minutes (yes zero minutes). I did that and then released the pressure after the amount of time it said to. When I opened my instant pot my noodles are still uncooked. Then after watching your video you set your instantpot to 10 minutes. Why does the instructions say zero minutes when your video you use 10? I just put the lid back on and I’m hoping that the repressuring of the noodles doesn’t make them mush. Lets hope I didn’t ruin dinner! The video is actually old, and my noodles were WAY overcooked that way! I wrote this recipe years ago before I was familiar with my Instant Pot. I now cook my gluten-free noodles for 0 minutes, with a natural release for a better texture. Were your noodles gluten-free? For whole wheat pasta I do 3 minutes with a 10-minute natural release. You can definitely repressure the pot without issue if you need to cook them longer, so I hope it worked out for you anyway! I made this with regular wheat macaroni, egg free, and it turned out well. I want a little more cheesy funk so will add some garlic powder next time. First time trying dried pasta in my IP and thrilled it worked! Thank you! Brilliant recipe! I have a 6 QT IP and had minimal “sticking”. I did an “adult” version with the following modifications. Sautéed onion and Green Chile (I’m from NM!) in a bit of oil to start. Used 12 oz. regular pasta. It was NOT done with 0 minutes (and I accidentally let the NPR go to 10 minutes), so I would likely use about 25% of the time on the package next time. Eg, 10 minute stove cook, maybe 3 minute HP, the 8 minutes to NPR. Steamed Broccoli to add to finished dish. AMAZING! Next time I might sauté some extra veggies initially (onions, red bell pepper, zucchini) and then remove to add at end. Then proceed with recipe. Extra nutrition and the bit of oil may also help with the sticking. Thank you for sharing! That sounds delicious. I think the 0 minute cook time only works if you start with a COLD pot– sauteing the onions before hand preheats the pot, and as a result that would shorten the cooking time with the pasta because you’re already starting with the bottom being hot. I do think the added oil will help with sticking and it’s supposed to help reduce foaming. We love your other mac and cheeze recipe (I make a huge batch weekly!) and I am excited to try this one! 12oz pasta won’t be enough for my family though, and I know with the Instant Pot it’s not always a straight double for liquids. How would you modify either for a full pound of pasta (such as 16oz of the TJ’s brown rice fusilli) or for two 12-oz packages of brown rice elbows (Tinkyada)? Thanks! We love this recipe and make it nearly weekly! I add a steamed head of broccoli and frozen peas. My only complaint is that it always burns in my InstantPot. I tired using cooking spray, and tinkering with the cooking and resting times, but nothing helped. It wasn’t a big deal, we just needed to soak and scrub the pot a bit more. Then my InstantPot died, and I got a new one. The new version has a “burn” feature, and stops cooking once food starts to burn to the bottom of the inner pot. We are not gluten free and just use regular pasta; I’m not sure of that matters. Any ideas for us to enjoy this recipe again? We love this Mac and Cheese! Thank you for the recipe. Would it work to double it? Any changes or just twice as much of everything same time? I made this tonight in the 5 qt Instant pot. Glad you mentioned the “burn” response as this is the first time I’ve ever seen it – but you made it so I didn’t panic and just continued turned off the pot (it was already up to pressure) and let it sit for 8 minutes. The only “modification” I made, I didn’t have nutmeg and I put in less salt and I had to use penne noodles as they didn’t have shells. .After I took the lid off I stirred in a large handful of fresh baby spinach. This turned out AWESOME! Even my roommate – who looked sidewise at anything vegan – like it. It took a couple of minutes to clean off the stuck noodles on the bottom of the pot, but they weren’t burned and I know next time to put down a layer of broccoli or some other vegetable. I will be making this again because its so easy and fast to make and the resulting dish is so rich, creamy, tasty and filling! Great job! This just became a “go to” for me! This is THE BEST vegan Mac and cheese! Do yourself a favor and make this! I followed the recipe exactly with the exception of using 2 cups of veg stock in place of 2 cups of water to blend the sauce and I reduced the amount of salt to 1 tsp because I used the stock. I also stired in 3 sliced of Follow Your Heart smoked Gouda right before serving! My carnivore 15yo son really liked it as well! I make this all the time. After it’s done I add steamed broccoli. Is a family favorite and super easy. We love it. THIS looks amazing — do you think i could double The recipe in my 6 qt instant pot? Just tried this and it was fabulous! I was skeptical about cooking for 10 minutes, but the noodles were so creamy and just wonderful. We only used about 1/2 t. salt and it was still delicious. We mixed in roasted broccoli – what a great idea! Thank you. This is so good! My husband and I can’t tell it’s vegan. It’s our go-to Mac and cheese recipe. I put dry pasta in the Instant Pot, and it cooks in the water all at the same time! I tried for an hour to get this recipe to work in my instant pot duo 7-in-1. I followed the directions to a tee but before the pressure had built up fully my IP kept giving me the “burn” error message. I tried adding more water (4 extra cups in total! ), reducing it to low pressure and lowering the cooking time all the way down to 1 minute. My duo continued to give me the burn error message before it had reached full pressure and started the cooking timer. I’m sorry to hear that! I’ve never seen the burn error before, but I have had issues with my sealing ring not working in the lid every now and then, and that prevents the pot from coming to pressure. Do you clean the sealing ring and lid between uses? Also, I’ve had mine not come to pressure if I’ve cooked things back-to-back in the pot, as the sealing ring expands from the heat and then won’t seal properly again until it has cooled down completely and I make sure it’s properly back in place. Since you technically only need 1/2 cup of water for the Instant Pot to come to pressure, there should be plenty of liquid for it to come to pressure, but I wonder if the variety of pasta changes things at all? I think pasta recipes are the absolute trickiest in the Instant Pot, which is why this is the only one I’ve posted so far. I hope you’ll be able to at least cook it on the stove top if you can’t get your Instant Pot to work tonight! My IP Duo is brand new. I just received it today. This was the very first thing I tried to cook in it. The pasta was sticking to the bottom really bad (which is why the burn error message came on) that is why I kept adding water. We were able to eat it but it did stick super bad to the bottom of the pot, despite my adding more water and stirring between tries to get it to full pressure and cook-time. I no longer own any pots or pans. Only my 6 qt IP Lux and now my new 8qt IP Duo. I had to toss my cookware because it was aluminum coated with adonized steel and the coating was flaking into our food….very toxic. My IP’s are safe, non-toxic, stainless steel. They are all I have to cook with for now. I do not buy “gluten-free” products and used an organic, whole-wheat pasta for this recipe. Could that be why there was not enough water and so much sticking? Now that I’m officially writing a healthy Instant Pot cookbook, with LOTS of recipe testers helping me, I’m learning that the 8-quart pot has this burn issue a lot! I think it requires that you scale the recipe if it was originally developed for a 6-quart pot, as mine are. Good to know for the future that most Instant Pot recipes should be scaled to 1 1/2 or 2x the amount for an 8-quart pot. This recipe didn’t work with chickpea pasta. Half of the pasta cemented itself to the bottom of the IPot and never pressurized. Are you using a 8-quart pot, by chance? The 8-quart version usually requires that you make a larger recipe and gives the “burn” error even when nothing is burning. It will just require more liquid to come to pressure, so I would try making 1 1/2 times the amount of recipes that are developed in a 6-quart IP. I’m so sad this recipe didn’t work for me. I have an 8qt DUO and i got the burn mark. Wonder if its because I used a different type of pasta (Riztopia / Whole-grain brown rice, Rice Brand, Water). I followed the recipe to a T. I wonder if I shouldn’t have mix the sauce and just leave the pasta in water, than pour sauce on top. Sadly, Im not sure I will try this recipe again in my IP. Im trying to save the day by simmering it all on the stovetop. Hi! My instant pot burned at the bottom when it came up to high pressure. I’m very green to the instant pot, so it could have been a user error, but I followed closely. Anyone else have this problem? Any suggestions for trouble shooting? I took the lid off and am just letting it simmer in the pot without the lid to finish it off. But would love feedback for next time! Yes, I mentioned that my pasta almost always sticks to the bottom of the pan during this cooking process, which is why I have you reserve the 1/2 cup of water to stir in at the end of the cooking process. I found that helps to remove any stuck pasta on the bottom. If it truly burned on the bottom (like black on the bottom), you might want to just scoop out the pasta and sauce on top so the bottom part doesn’t affect the overall flavor! Hi Megan! We use use this recipe often and love it but I was wondering if cauliflower rice would work as the “mac”? You can use cauliflower rice, but I wouldn’t cook it in the instant pot for 10 minutes. I usually cook cauliflower for ZERO minutes (that’s a real setting on the Instant Pot!) and then do a quick release because otherwise it’s mush. 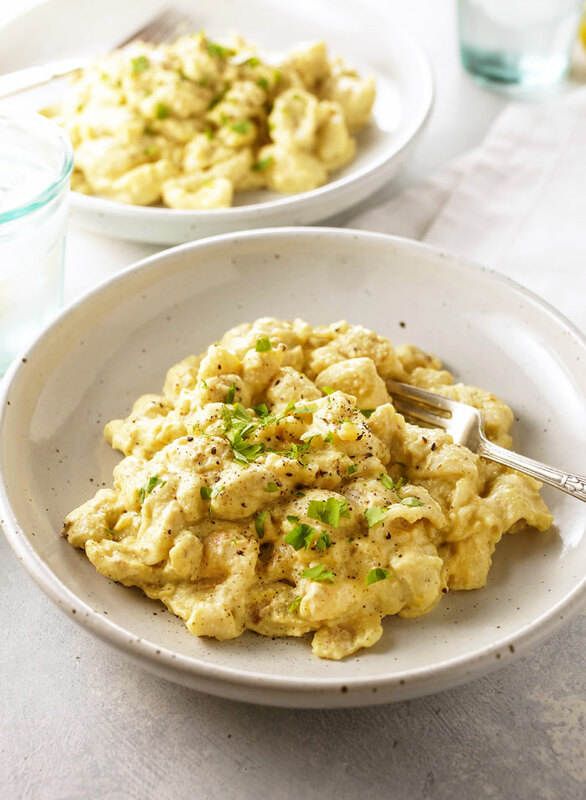 So, you might want to make my other Vegan Mac n’ Cheese Sauce and then just pour it over cauliflower rice that has been briefly sauteed so that there is still some texture there! I MADE THIS WITH CHICKPEA FLOUR PASTA SHELLS AND IT WAS FABULOUS! I USED 16 OZ OF PASTA SINCE EACH BOX WAS 8 OZ AND I MAY ADD A 3/4 CUP OF WATER AFTER COOKING INSTEAD OF 1/2 CUP BUT THE FLAVOR WAS WONDERFUL. THANK YOU! Hi Megan! I’d like to try this recipe on the stovetop, but I’m a little confused with the stovetop directions. Could you basically prepare the sauce in one pot, cook the pasta in another pot and then mix drained pasta in sauce? How much water should be in the sauce when cooked on stovetop? Thank you for the clarification! I made this last night, it was amazing!! I added in frozen veggies and spinach. I love your blog and books! Thank you for introducing me to the instant pot. I bought one per your suggestion and I love it. I did try to make this recipe and didn’t have any luck. I have an 8 quart instant pot and the pressurizer button never popped up to seal the pot. I’ve had this happen with a couple of recipes. Also there have been times when I have had to push down on the handles to get the pressurizer button to seal (it didn’t work with this recipe). Is it possible that my pot is defective? Any suggestions? Thanks! I’ve had that happen with a couple of recipes, too! I thought mine was defective, but I found that sometimes that rubber sealing ring that wraps around the underside of the lid needs to be cleaned with a towel. (I also think the vent area needs to be cleaned sometimes– you might want to check your manual or the Instant Pot website for how to do that.) When I remember to clean the sealing ring, my Instant Pot usually works properly. Also, I think pasta is particularly more challenging for the Instant Pot, in general, so if that keeps giving you issues you might want to skip the pasta recipes and opt for more whole grain options, like quinoa or rice, which has never caused me issues. OMG!! I just ordered your book! My kids who are picky and difficult to introduce new foods to are in love! They ate this without any problem. I’m trying to clean up our diet and get them to love eating delicious, healthy foods as I did as a child, and I’m hoping with with a little help from you to achieve this goal. Thank you so, so much! Yay! I’m so glad to hear that!! I hope your kids enjoy the recipes in the cookbook, too! Has anyone tried tossing this sauce over steamed cauliflower? I can’t have cashews but I can have walnuts. Do you think I could use walnuts? Macadamia nuts work similarly. I’ve seen cashew mac recipes made nut-free with sunflower seeds, but the flavor will be stronger if you use those. This looks so amazing! I am always looking for new vegan mac and cheese recipes. I don’t have an instant pot, but I wonder if it will work the same if I cook it for longer? Or perhaps in a crock pot? I’ll give it a try and let you know! I’m on a strict diet trying to reduce GI and total body inflammation. No-no’s include dairy and wheat. I love mac n’ cheese so I tried this recipe. It doesn’t taste cheesy to me but I liked it alot. It’s filling and freezes well. This recipe is a keeper for me. Does anyone know how this reheats? I wanted to make but will forsure have left overs, wondering how it reheats and how long it can be stored in the fridge. While every one of your recipes I have tried previously have been amazing, this did not work in my slow cooker. I used a 12 oz bag of Trader Joe’s black bean gluten free pasta, followed the recipe and put it in my slow cooker on high for 3 hours. I got a mushy savory pudding. Delicious, but not able to be served. I will stick to the non-instant pot recipes. Thanks anyways! That black bean pasta turns to mush when you cook on the stove for normal time on the bag so that is not a good pasta to cook for three hours in a slow cooker. Is the 1 tablespoon of salt, correct? I made it and it was very salty! Next time I think I will only do 1 teaspoon. I really enjoyed it otherwise and will be trying again for sure! I think I just have sensitive taste buds! I did use the Real salt brand as well. The recipe is amazing regardless! I will definitely be making it at least once a month for the family! Thank you! This was so good! I made it on the stovetop. In the future, I may put a little oil in the bottom to grease the pot, as some burnt and stuck in my metal pot, but overall AMAZING for a gulten/dairy free mac and cheese. Last time I made a recipe with nutritional yeast, my husband, mother, and I all experienced the worst gas ever!! It was so awful, and I’ve never used it since. Is it something you can build up a tolerance to? There’s not really a good substitute for it is there… So sad because I really want to try recipes like this but I’m scared to now! It might have been the cashews. Some people, like me, cannot eat much raw cashews.. So excited to try this– I love the Trader Joes Quinoa pasta. Think the timing will be the same? 10 minutes with another 10 minutes of pressure release seems like SO long. I’m worried about it turning to mush. Gluten-free pasta is usually super-tolerant of overcooking. I used Trader Joe’s brown rice pasta for a few of my trials, and it was just fine– but I didn’t love the flavor as much. (Their quinoa pasta does taste better.) Feel free to experiment with less time, if you like. Some recipes I looked at while researching this one had you cook for half of the “recommended cooking time” at high pressure, with a quick release, but that always left me with pasta that was too al dente for my tastes. It worked super well with the Tolerant lentil pasta. I only had an 8 Oz box so I used that, made the sauce exactly, but I only added one of the two cups of rinsed out blender water. It got a bit stuck to the bottom, but so delicious. Good to know — thanks! Would this work with pasta that does contain gluten? Thanks! I finally found nutritional yeast for a good price, so I’m eager to try it. Trader Joe’s now sells it for $2.99! I imagine it would work the same, but I only tested this with gluten-free pasta. Will you please let us know if it works for you? I will post when I try it. Thank you!